I enjoyed concocting this seasonal salad, packing it full of the colors, flavors, and textures of fall. And to tie it all together, a lovely fall-inspired maple vinaigrette to drizzle over top. This would be a perfect addition to your Thanksgiving table. It will definitely be a part of our menu because right now, it's my new favorite salad! Wash and spin dry lettuce before placing in a large bowl. Top with pear, apple, onion, and dried cranberries. Drizzle with vinaigrette and toss to coat. 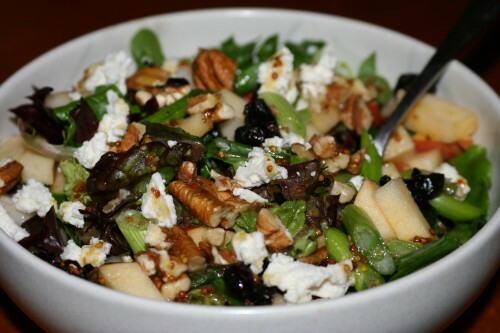 Sprinkle salad with nuts, bacon, if using, and goat cheese. Serves 4. Combine all ingredients in a glass jar. Shake well.